One needs a cheat sheet to sort out the acronyms of all the associations and educational partners that came together to launch Colorado’s first green industry apprenticeship program. The three-year Arborist Apprenticeship will launch at Front Range Community College, Westminster, fall 2019. 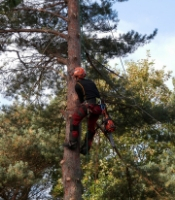 The international Tree Care Industry Association (TCIA) scoped out the apprenticeship and obtained U.S. Department of Labor (DOL) approval in 2018. Front Range Community College (FRCC) with Ray Daugherty as point person, worked with TCIA to develop curriculum. In June 2018, TCIA turned over the apprenticeship to local organizations to refine details and secure the administrative sponsor DOL requires be in place prior to offering an apprenticeship. Volunteers from Associated Landscape Contractors of Colorado (ALCC) and International Society of Arboriculture, Rocky Mountain Chapter (ISA RMC) comprised the task force. Colorado Community College System (CCCS) agreed in late 2018 to assume the role of administrative sponsor. ALCC will serve as the industry partner to promote the apprenticeships among Landscape Career Pathways high schools statewide and to solicit resources. ISA RMC provides the benchmark qualification via the ISA Certified Arborist designation for grandfathering Journeyworker Arborists who will train apprentices. ISA members will continue to offer direction on journeyworker and related requirements. The three-year program will provide a career pathway for aspiring arborists to earn nationally-designated status as Journeyworker Arborists. The apprenticeship will involve a combination of classroom education and hands-on experience at FRCC in addition to one-on-one work with a designated journeyworker who also works at the apprentice’s place of employment. The program has been designed so that class hours will be user-friendly to both employers and apprentices. Projected tuition cost per person for all six semesters of the three-year program is approximately $6,000 total ($1,000/semester). Scholarships available to FRCC students and funding from local Workforce Centers may help with costs. Green industry pros serving on the task force include: Adrian Camacho, City of Aurora; Sara Davis, Denver Parks & Recreation; Becky Garber-Godi, ALCC; Stan Holat and David Vine, SavATree; Matt Mayo, Preservation Tree Care; and Josh Morin, Taddiken Tree Company. Educators Ray Daugherty, FRCC and Michael Womochil, CCCS also participated. This story appears in the January/February issue of Colorado Green. Read the full issue online at www.alcc.com/cg.